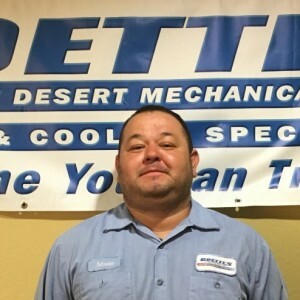 * Total number of reviews and star-ratings are based on data collected during the time period Goettl's High Desert Mechanical has been using the ReviewBuzz system and may not directly match the data found on each public review site. Excellent service - they responded so quickly and efficiently! And this was NOT an easy job! Kudos to all the staff and especially Daniel who replaced our 20 year old water heater with a new one in a very tiny closet. We'll be calling them for all our heating, cooling and plumbing needs! Very prompt and knowledgable. Will use them again. Showed up on time, took care of a simple pipe break, replace a gasket. Then fixed disposal - had a piece of plastic stuck in the propellers. In/out, easy/peasy. Thank you for providing the true definition of Professional Service. 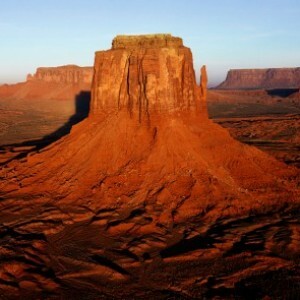 Goettl's came highly recommended to us as recent homeowners in Sedona,. We understand why, the service by Adrian was fantastic. He was professional and knowledgeable and reviewed everything we need to know. I highly recommend Goettl's HVAC. They have a great service range as well. We have been customer of Goettl’s since 2006. Very accommodating and very helpful. I recommend there service. Goettl's High Desert Mechanical and Derick Fringer were a pleasure to work with. The job was done on time and professionally. A complete heating and cooling company with friendly and knowledgeable staff. Carl T. did his usual great job on getting my heat pump and air conditioning checked out and prepared. Goettl’s has never let us down! We are very happy with our heating and cooling system, the quality of their work, professionalism and timely service. They have saved us numerous times with plumbing issues as well. Absolutely the BEST! 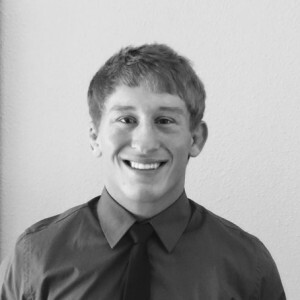 Derick F., a Goettl’s Plumbing Certified Technician is awesome. He spec’ed a home water softener and a under the kitchen sink RO filter and storage tank for me. Derick showed up on time and did the installation professionally and smiling. His work is neat and reliable. Overall a good solid experience with the support people at Goettl’s and Derick. We have a furnace less than 2 years old and inadvertently misaligned the thermostat settings so we got air conditioning on a wintry day !! To us it was an emergency on a cold night so we used our back up wood stove. Adrian responded the next day and corrected thermostat settings and showed us proper ways to adjust the thermostat. While here, he did a spring service check up and installed a Compressor Saver at our request. Adrian was helpful, patient knowledgeable and polite. We appreciate the prompt ,competent response. Greg A. just did our service on two Lennox split systems. He's very thorough, courteous & professional, and explained everything to us. A technician. We have been super impressed with Goettls from the first time with Luke for an estimate on replacing both systems in our duplex 4 years ago, right on through installation and service. We've also used them for plumbing needs. We will continue to be loyal customers of Goettls. We highly recommend! Derick is amazing! On time, very knowledgeable, professional and friendly. I had a tankless heater installed and it looks and works great. I asked him questions outside of the tankless install and he provided me with enough information where I could assess whether to move forward on other work I may have for him. I will definitely be calling Derick back to do more work in the future. Thanks again, Derick. See you soon. I wasn't there with Greg but my boyfriend said he was capable and did a good job. Can definitely depend on them to do a great job. A 1. 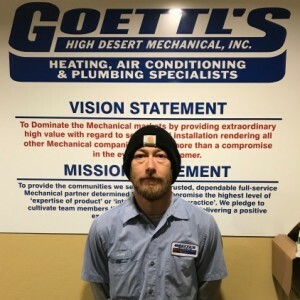 Goettl's High Desert Mechanical Team . 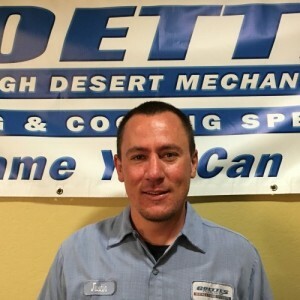 Customer service is always a top priority at Goettl's High Desert Mechanical. Our BBB Membership A+ rating is like a badge of honor as we continuously strive to provide the best experience for our clients.